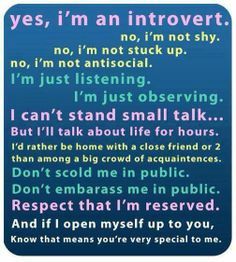 Yes, I am an introvert. No, I’m not stuck up. I’d rather be home with a close friend or two than among a crowd of acquaintances. Don’t scold me in public. Don’t embarrass me in public. Respect that I am reserved.